If there is a conversation about professional bass fishing going on anywhere these days, you can bet the letters KVD are being spoken. Over the last 25 years, Kevin VanDam’s name has become synonymous with the sport of competitive bass fishing. VanDam’s sheer dominance on the water in the modern era of professional bass fishing is unparalleled. He has set a bar with a rod and reel that few others in history will ever come close to reaching. Though VanDam is well versed in all fishing techniques, it’s his signature power fishing game that has earned him so much success through the years. Since the day he stepped foot in his first full season of Bassmaster Invitationals in 1990 at the age of 22, KVD’s unique fishing style has been heavily steeped in speed, reaction and extreme efficiency. He pioneered an up-tempo, offensive strategy in competitive fishing that forced his quarry to react instinctively to fast moving lures like spinnerbaits, jerkbaits and crankbaits. Using such fast-paced lures allowed him to cover more volumes of water than his competitors. After winning the BASS Angler of the Year on his first season on the BASS Top 100 circuit in 1992, naysayers of his unconventional fishing style claimed that such a blitzkrieg approach to bass fishing would never hold up over time. However, year after year KVD has continued to amaze his peers with tournament wins and Angler of the Year titles. To this day his stats are stunning: 7 BASS AOY Titles and an FLW AOY title; 4 Bassmaster Classic wins; 25 total BASS wins and 3 MLF Cup wins. 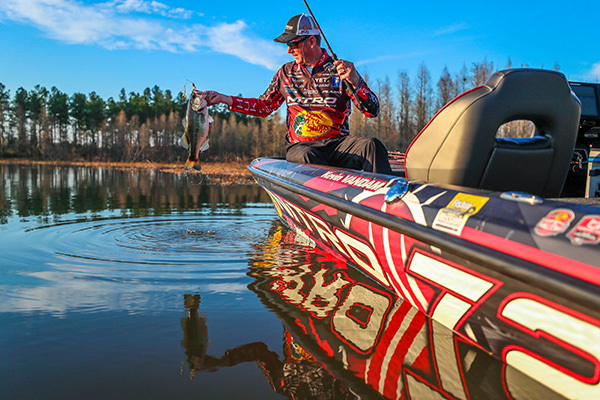 What’s more, KVD has competed in 313 BASS events and owns 112 top-10 finishes. Amazingly, he has scored a top 10 in 35 percent of the BASS events he has ever entered. Since then, numerous anglers across many levels of bass fishing competition have tried to duplicate KVD’s fast-paced, power-fishing style, but none can quite do it like him. Off the water, KVD brings that same winning formula to the business side of his brand. His dedication and loyalty to his sponsors is the gold standard of being a true professional bass angler. The way he applies himself to promotions, appearances, seminars and product design could only be described as tenacious. The time he spends with outdoor media is uncompromised, providing genuine, honest content backed by proven results. In all, KVD’s intensive input to fishing products and information has helped thousands of people catch more bass across the globe. At home, VanDam is also the model family man. As a husband to his wife Sherry and a father of two boys, Jackson and Nicholas, there is nothing VanDam relishes more than family time in the outdoors, taking his boys hunting and fishing. 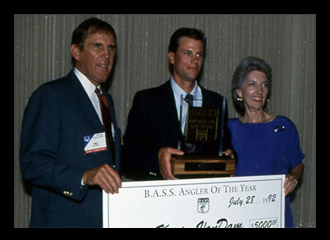 KVD after winning Angler of the Year in 1992. In 2018, KVD experienced two major milestones in his life: turning 50 and being inducted into Bass Fishing Hall of Fame. At this point in his career, he could easily step away from the sport and retire; however, resting on his laurels is just not in VanDam’s blood. Instead, his desire to build bigger gateways into fishing for anglers and fans alike has only become stronger. In 2015 Kevin and Sherry started the KVD Foundation to help garner contributions for charitable organizations that focus on children’s health, education and outdoor experiences. Through the foundation they have contributed thousands of dollars to the March of Dimes, St. Jude Children’s Research Hospital, Bronson Children’s Hospital and the Michigan DNR Outdoor Adventure Center. The VanDam’s have also supported the college fishing movement by sponsoring college events in the Midwest and awarding thousands of dollars in college scholarships over the last few years. More recently, VanDam’s tireless efforts have been instrumental in the successful launch of the Major League Fishing Bass Pro Tour in 2019. The Bass Pro Tour features the popular, fast-paced format of MLF and KVD is certainly looking forward to bringing his signature up-tempo style to the new game. Kevin VanDam’s performance record on the water speaks for itself, but it’s his desire to teach fishing, promote healthy competition and share the wonderment of the outdoors with others that truly makes him the one and only KVD.